"I called all around Canada looking for a servo I needed and wasted a couple of days doing it. I then decided to do a Google search and found what I was looking for at RepairZone. The motor is working great and I will call the next time I need you. Thanks!" Need a fast repair on your AB Drive? Need it returned soon? We are experts at Allen Bradley servo drive repair, not because we say we are, but because we have repaired so many of them! We repair older generations such as 1391, spindle 1392, 1394, 1336, 8520, 1388, 1389, along with newer generations. We perform preventative replacement as well when we are repairing your drive so future breakdowns can be avoided. 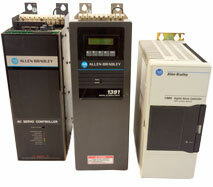 We test all drives on Allen Bradley controls and motor systems. We give every repair a 1-year hassle free warranty. "We bought a drive from you that worked for a month. Suddenly, it quit working. You guys sent us a new drive the next day and I shipped you back the faulty unit for you to repair for your inventory. I am more than happy with your warranty exchange service and how quickly you were able to help us out. That is what I call a hassle free warranty. Way to go!!" Your 100% satisfaction is our guarantee, contact our Customer Care today! Our repairs average 70% less than buying new. Get a repair slip to get a precise quote and a fast turnaround. Or, browse our Inventory for repair, exchange, or purchase. Would you rather talk to a tech? Call us at 989-922-0043 and we would be happy to help!